This post talks about Everything, Everything by Nicola Yoon and Before I Die by Jenny Downham in detail. You've been warned. Anyways, this is an essay that I wrote for my Masters' program after getting furious after reading a book. I would love to hear about more in the comments. Especially if you feel different. I would also like more book suggestions on YA with illnesses. Anyways, I hope that you enjoy this post. As a teen, I wanted to find a book that contained my experience as a teen battling a chronic illness, known as Common Variable Immunodeficiency. 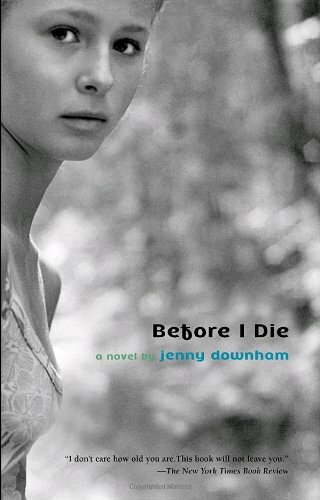 In 2009, I had the pleasure of reading Before I Die by Jenny Downham. After years of battling a chronic illness, I finally felt validated from Tessa’s experience of battling leukemia. I believe that Before I Die remains the most genuine and accurate portrayal to my experience as a teen with an illness. Earlier this year, I became excited to hear about Everything, Everything, by Nicola Yoon, which is about a character with severe-combined immunodeficiency (SCID). For the first time, I would be able to read about someone with a similar experience to my own. I found myself to be disturbed by the lack of research given to Maddie’s character and her illness; a stark contrast to the author’s efforts in Before I Die. Maddie’s narrative doesn’t create any sympathy for her as she remains rather flat in her development over the book. Tessa’s narrative also contrasts from Maddie’s by creating a connection to the reader from the first page that develops from the relationships in the book, because the supporting character reinforces the reader’s perception of Tessa. Downham displays that illness affects more than the patient, but their friends and loved ones. Lastly, Downham doesn’t discount the reader and she gives the ending promised by her on the first page. Yoon betrays the reader by taking the premise away from them and conveniently changing the information to suit her need for a happy ending. Overall, the difference between Everything, Everything and Before I Die center around the portrayal of illness, creation of character, and deciding on an ending true to the story. In Before I Die, Tessa distances herself out of fear of what she leaves behind. At the same time, she wants to feel a connection to her family and friends. Tessa struggles in letting Adam into her life as she recognizes her imminent death. She knows that a relationship will adversely affect his life by creating a hole in her world. Tessa shows this by her defense of isolation, “I hide under my hat again, just for a bit, because I’m going to miss breathing” (Downham, 6). She knows that slowly her illness will take away the simple things away from her. As the both the pain and prognosis continue, Tessa remarks on more things that she will miss like breathing and loved ones. Tessa also realizes that her condition has made certain limitations, but she bothers with her list and she desires challenging these concerns. After an adventure, Tessa’s mom remarks, “You slept for two days solid when you got back” (Downham, 169). This remark shows a development of the condition over time and how it alters the life of young adults. Downham allows the reader to imagine illness with complexity instead of simplifying the disease to basic language and actions. On the other hand, Yoon doesn’t allow her readers to imagine the case in a complex manner. Maddie explains her illness as, “Basically I’m allergic to the world” or “bubble baby disease” (Yoon, 3). “Baby bubble disease” is a cultural explanation of the disease, while in fact, this diagnosis requires several different doctors prior to diagnosis of SCID. As someone with an immunodeficiency, I know that the experience varies on the symptoms and subtype. SCID centers around minor infections becoming severe due to the lack of immune response from white cells, B-cells, and T-cells, which affects the responses to infections and allergens. Current gene therapies and bone marrow transplants allow for the SCID to be treated with minimal impact on the patient’s life. Yoon also simplifies how germs interact with the explanation of “she has to remain in the air lock until the filters have a chance to purify foreign air” (Yoon, 29-30). Everyone carries germs both on and in them. As would everything in their house contain some sort of germs. This infuriates me, because a basic Google search would’ve solved many of Yoon’s issues of portrayal. As readers, this mistake is inexcusable. Tessa’s usage of medical terminology conveys her experience as a sick teen. For example, Tessa remarks, “Steroids did that. High doses of Prednisone and dexamethasone” (Downham, 33). For people that have been sick, they understand the complexity of medication as it becomes a part of their vocabulary based on necessity. Maddie feels more limited to her medical history due to the control of her mom, but based on a device used by Yoon, Maddie should be able to research her illness. The usage of ‘webdoc.com’ shows a familiarity and literacy of the medical world (Yoon, 78). At the same time, she never uses the internet to find a possible cure, a contrast to what happens in Before I Die, where Tessa refers to her dad’s constant searching of the internet for some sort of cure. As a result, I couldn’t believe Maddie’s acceptance of the fate to remain in the house of a permanent basis. Both books, Before I Die and Everything, Everything, present their characters in 1st person point of view, which gives the reader access to the character’s emotional state.. Tessa’s narrative causes for the reader to hope for the best. The reader can also attest to many of her feeling if they’ve experienced a similar issue. One part that struck me, “I’ve been touched by so many people, prodded and poked, examined and operated on. I thought my body was numb, immune to touch” (Downham, 211.) As someone with a chronic illness and pain, this part linked me to Tessa. I know how this disconnection between touch exist as hospital life separates from romantic life. Tessa begins to experience love from an action that usually results in pain. Downham begins to create a complex identity that the reader identifies as recognizable to other people in their life. Often, writer portray people with illness as isolated and either blessed or damned. Tessa adores her family and friends, which links the reader to her. Maddie didn’t have these links to the reader, which made her seem flat. For example, Maddie obsesses over a boy and she doesn’t think about the consequences of her actions. Carla expresses that Maddie might have not met one of her “triggers” (Yoon, 185). Either way, Maddie unwarily could’ve died. Olly allows these actions even though he loves her. As a reader, I wanted for her death to happen to her so the book would end. Maddie doesn’t care about Carla losing her job or her mom at this impactful plot moment. She selfishly risks her life for a boy. Except Yoon betrays the reader by magically curing Maddie,“I am not sick and I never have been” (Yoon, 275). As a reader with a very similar disability, I found for this to be extremely problematic and offensive to possible readers. The visibility of chronic conditions like Primary Immunodeficiencies already creates skeptic of conditions. Yoon furthers this thought, because she explains away the illness as an invention of a woman trying to cope with the death of her husband and son. Maddie finds her happy ending from this explanation, but most people continue to battle an illness after getting rushed to the hospital. The fact that Yoon doesn’t give what she promises as the author of the story made me furious. In Before I Die, Tessa dies as promised, but instead of writing about how her life blessed others or forcing the reader to stumble through a funeral or death scene, Tessa dies in the room that this story begins. Unlike Yoon, Downham depicts a relationship that allows us to explore the dynamic between a couple where one experiences disability and the other remains healthy. Tessa remains worthy of Adam even as she dies, which contrasts with Maddie and Olly. Adam worries about hurting Tessa and he remains aware of her condition throughout Before I Die. Maddie becomes worthy of Olly after she is no longer ill. This ideology expresses that only healthy people can date each other and find a happy ending. As someone who is disabled, I found this rhetoric to express unintentional ableism. People with chronic conditions often encounter stigmata about their condition, but their ability to love others remains one of the most crucial ways of survival. Tessa displays this throughout the book as her main concern as she focuses her attention on how everyone else will survive without her presence. Yoon should’ve thought about how damaging her story could be to teens with SCID or similar stories, because the only way to have a happy ending comes out of erasing their experience and the truth in their life. As a result, Yoon invalidates the illness and she reduces the illness to just a plot point. As writers create fluid characters, readers recognize themselves in the minor details of the condition. When talking about a topic, an author's research remains essential to all elements of the story crafted for the reader. Downham displays this into a character with so much heart and connection. Before I Die expresses a period in my life of uncertainty and doubt. Downham assures the reader that there’s a silver lining to even the most tiring existence, because all humans remain more capable than they believe. Yoon centers her story around love and she creates a promising premise that would’ve exposed readers to an illness that remains unknown. Yoon discounts the reader and the characters by not utilizing her premise to explore the complexity of illness. Overall, writers need to think about the content that they create and how their writing may be taken out of context. This notion doesn’t mean to censor writers, but it rather challenges authors to think about the voices that they silence or invalidate by their plot. Books about illnesses deal with difficult topics that exist in our lives, but being a good human means confronting these truths. As writers, we decide how the world will interpret our craft by creating unintentional messages within the text. In the relation of illness to young adult literature, there needs to be more books that empower people often underrepresented in books. When I think about the girl that I used to be, I think about the impact that books like Before I Die gave in empowering in my writing. On the other hand, books like Everything, Everything reveal the need for more education and awareness of illnesses and disability. I didn’t feel valued in that book, in fact I felt disposable like a plot device. Either way, readers need to be able to recognize others with their illnesses and feel empowered by the stories. Erasure of diseases in books doesn’t stop the people battling against the condition, but it silences their issues. Downham, Jenny. Before I Die. Oxford: David Fickling Books, 2007. Print.